Beta-lactams are a class of antibiotic medications that enjoyed an initial run of efficacy against their bacterial targets. They do so by disrupting the process by which bacteria form protective cellular walls around themselves, thus killing individual units and preventing their multiplication within a host’s tissues. Examples of beta-lactams include carbapenems, cephalosporins and the classic antibiotic penicillin. Unfortunately, the bacteria affected by these drugs fought back with adaptations, the most prominent of which are beta-lactamases, or enzymes that inactivate antibiotics with the basic beta-lactam structure. These events are thought to be associated with the profligate use of these antibiotics. A report newly published in Nature Communications describes a recently-discovered form of these enzymes, known as New Delhi metallo-beta-lactamases (or NDMs). These bacterial products are already regarded as a serious public health threat. On the other hand, the in-depth picture of how these enzymes work documented in the new paper may lead to effective beta-lactamase inhibitors. Beta-lactams are the active ingredients in antibiotics such as penicillin, as well as more modern medications such as cephalosporin and its derivatives. They are all based on a characteristic four-carbon-ring chemical structure, which inhibit the bacterial enzymes (transpeptidases) that have essential roles in the formation of bacterial cell walls. Beta-lactams diversify through R groups that attach to specific carbons in the central ring structure. For example, penicillin has such a group on the sixth carbon in this structure, whereas carbapenems have groups on the first and second carbons. Beta-lactams are linked to a history of robust antibacterial properties, and have been the treatment of choice for diseases involving dangerous enteric bacteria and staphylococcal infections. However, this led to extensive and disproportional popularity in the use of these antibiotics. This in turn led to beta-lactam resistance, which arrived in the form of beta-lactamases. These enzymes were evolved to hydrolyze the bonds in the beta-lactam ring, thus inhibiting these normally fatal transpeptidase substrates. Beta-lactamases are now known to fall into four distinct classes, depending on the specific mechanism each enzyme uses for hydrolysis. NDMs are class B beta-lactamases, as they are metallo-beta-lactamases. This class hydrolyses their target through the use of zinc-II ions at their active sites. Therefore, class B enzymes do not require an acyl intermediate, unlike the other three classes that depend on a serine residue at the active site. Class B beta-lactamases are observed to have a homology that results in similar secondary structures and motifs for their metallic components. However, they divide into further sub-classes beyond this, which is based on a poor understanding of the finer details of how they hydrolyze substrates. NDMs are among these lesser-studied sub-classes. NDMs are expressed from a plasmid, and have demonstrated the ability to inactivate nearly all beta-lactams in clinical use. Additionally, they are reported to be spreading throughout the world at an alarming rate. NDMs can even hydrolyze meropenem and imipenem, which are the latest version of carbapenem on the market. These beta-lactams are still resistant to most class A, C and D enzymes. 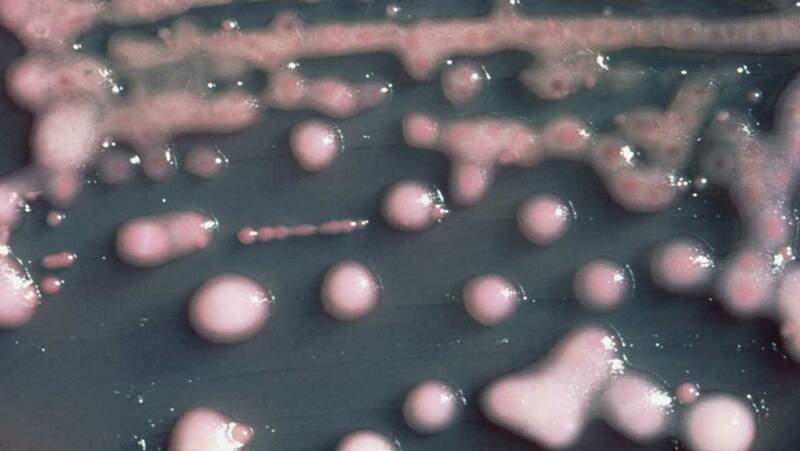 Researchers advise, therefore, that these antibiotics are used as a last resort. However, NDMs appear to have the potential to render even this measure pointless. The earliest studies of NDM-1 (the first version of the enzyme discovered in 2009, and also the best-known example of NDMs since then) used crystallography, spectroscopy and kinetic studies to report that these enzymes have two ZnII ions which are each bound to three amino acids each within their active sites. They are thought to use this center to first cleave a beta-lactam amide bond and protonate the resulting intermediate. A “bridging” water/hydroxide molecule between the two metallic ions then attacks the C-N bond at the beta-lactam’s C7. The broken ring then forms two carboxylates which bind to its own amide (N4) as well as the first Zn ion (Zn1) and the second Zn (Zn2) respectively, which may be the rate-limiting step in this reaction. This is followed by the formation of at least one temporary (EP) intermediate before the breakdown products dissociate from the enzyme. However, a team of researchers from macromolecule and biophysics labs at the Chinese Academy of Science, Beijing, and the Third Military Medical University in Chongqing, China, have reported that NDMs may diverge from this mechanism during the hydrolysis of meropenem or imipenem. The team used NMR and X-ray spectroscopy on NDM-1 molecules, which were bound to either antibiotic and converted into crystals of about 1.8 to 2.3 angstroms in resolution. This resulted in pyrroline tautomers of the enzyme-substrate that were reported to display accurate and robust representations of active-site binding and substrate features (i.e. the R groups) nevertheless. These crystal studies revealed, among other things, that NDM-1 did not require the “bridging” molecule to break the bond at C7. This water-independent hydrolysis results in many differences in behavior of the resulting carboxylates. For example, the N4 atom and C3 carboxylate of the former imipenem molecule interacts with Zn2 rather Zn1 as normal, leaving the C6-carboxylate to interact with Zn1 alone. This translates into considerable increases in atomic gaps between the carboxylates and the zinc ions, which ultimately precipitates into a reduced occupancy for imipenem in NDM-1 compared to that in other beta-lactamases. This does not mean NMDs are any less effective in breaking the antibiotic down, but is likely to change the nature of EP intermediates and the release of hydrolysis end-products. These results offer a new dimension of detail into the actions of NMDs, as well as more insight into the biophysics of their enzyme-substrate interactions. They mainly revolve around the absence of the bridging-molecule requirement, which is a considerable departure from NMD mechanics in the hydrolysis of cephalosporins or penicillin. These interesting findings will also hopefully contribute to the development of more specific and effective inhibitors for NMDs. Therefore, this report, published on the 21st of December 2017, may lead to a breakthrough that may combat the antibiotic resistance of the bacteria that express NMD enzymes in the future. Drawz SM, Bonomo RA. Three decades of beta-lactamase inhibitors. Clinical microbiology reviews. 2010;23(1):160-201.